About 100km northeast of Angkor in Cambodia lies the ancient Angkorian site of Koh Ker which was the capital of the Khmer empire between 928 and 944 under King Jayavarman IV and his son Hasavarman II. In this area a vast number of temples were built and with the recent clearing of the many land mines this has opened up this area for exploration by visitors. 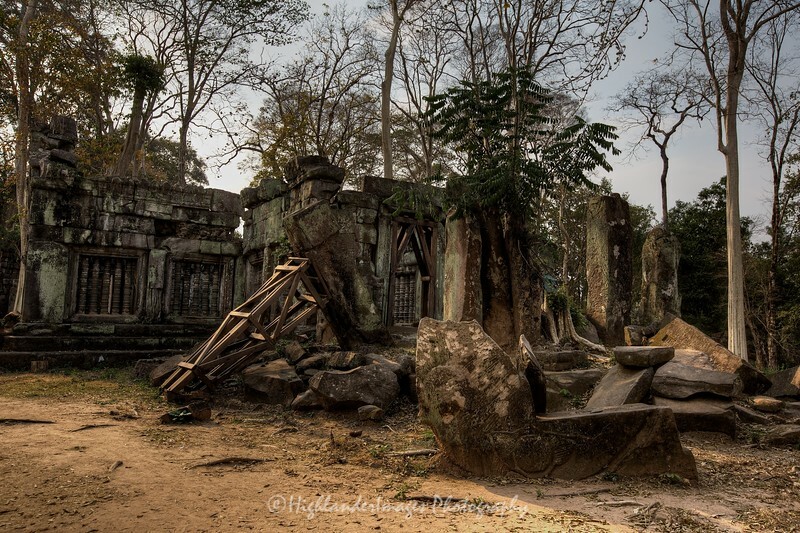 It is around a 3 hour drive from Siem Reap but if you are interested in exploring overgrown temples devoid of the usual tourist throngs you get at Angkor then it is certainly a worthwhile visit. In the centre of the Koh Ker area is Prasat Thom, a 30m tall stepped temple rising above the flat plain and surrounding forest. Arriving at this pyramidal temple as I emerged from the trees after walking through the tumbledown entranceways and monuments reminded me of a scene from movies like Tomb Raider or Raiders of the Lost Ark. Across the site of Koh Ker, there are many prasat or tower sanctuaries. A couple still feature an enormous linga on a yoni that provides space for several people. The outlet for the water that was sanctified by running it over the linga can be seen in the outside wall of one of them. In other cases, three prasat stand next to each other, dedicated to Brahma, Shiva and Vishnu. Most of them are surrounded by libraries and enclosures, many also had moats. At that time, the roofs were still made of wood. Today, only the holes for the beams remain in the stone structures. In late 2011, the remote location drew media attention worldwide when Sotheby's, an auction house specializing in the antiquities trade, attempted to sell a statue of a mythic Khmer Empire warrior. In March 2012, the US and Cambodian governments filed court documents to seize the statue that they purport was illegally removed from the site. A twin statue, also linked to the Koh Ker site, is on display at the Norton Simon Museum in California.